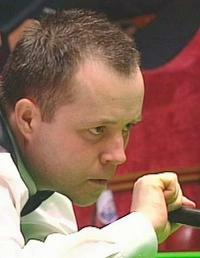 When John Higgins won his second world title in May 2007 he secured his place among the all-time snooker greats. Since then he has added a further two world crowns to his name to reinforce this further and standing third on the all-time list of ranking event winners, continues to compete for titles at the very highest level. With an excellent snooker brain, Higgins is widely regarded as having taken over from the great Steve Davis as the best tactician currently in the game. This is not to say that he is a grinder however as with over 400 career centuries to his name (behind only Hendry and O’Sullivan on the all-time list), Higgins is just as capable of scoring heavily when he is in the balls. 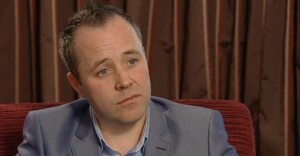 It is a measure of how highly Higgins is regarded however that despite his many titles, it is sometimes argued that he should have won more during his career. Following his first world title in 1998, many expected him to go on and win several more but for one reason or another it took him another nine years to win his second. Now on four and playing as well as ever though, he is certainly making up for lost time. 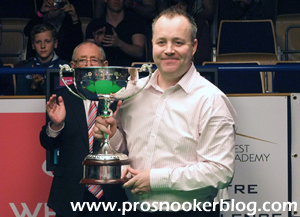 Having come through the ranks at the same time as contemporaries such as Mark Williams and Ronnie O’Sullivan, Higgins got a taste of things to come from a very early stage in his career. Although he lost to Williams in the British U-16 Championship, he managed to defeat the Welshman to claim the 1991 World Masters before turning professional for the 1992/3 season. Despite his amateur successes the start to his professional career was surprisingly unremarkable however, his best result during his début season being a run to the last 16 at the Rothmans Grand Prix. Starting the 1994/5 season at 51st in the rankings, it was time for Higgins to announce his talents on the world stage. He won his first ranking event at the Grand Prix with a 9-6 win over Dave Harold before backing this up with wins in the International Open and British Open. In addition he reached the final of the prestigious Benson and Hedges Masters for the first time as well as the Regal Welsh where he lost to Ronnie O’Sullivan and Steve Davis respectively. 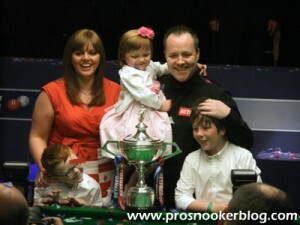 As a result of this fantastic season Higgins was up to 11th in the rankings and well placed to move higher still. This he did in 1995/6 by winning a further two ranking event titles and reaching his first World Championship quarter-final. This put him up to second in the rankings where he was to remain until 1998. 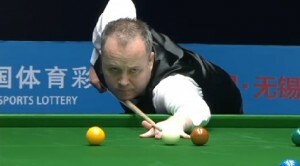 Having continued to perform consistently well in ranking events, Higgins came into the 1998 World Championship with an outside chance of becoming world number one if he could win the event with Stephen Hendry going out in round one. 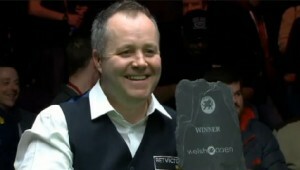 Hendry’s defeat to old foe Jimmy White at the first hurdle gave Higgins the chance and he was not to be denied. 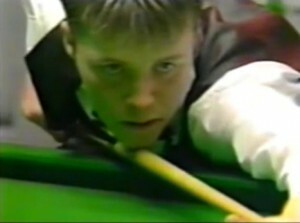 After he had beaten Ronnie O’Sullivan in the semi-finals he faced defending champion Ken Doherty in the showpiece final. Ending the tournament with a tally of 14 centuries (a new record at the time), he defeated the Irishman 18-12 to take his first world title and become world number one. “It completely threw me for the whole session. Instead of concentrating on the match and trying to get to 17 frames I was wondering why he did that, even though it was probably just an oversight on his part. “Who knows where my career would have gone from that point if I’d beaten him? I could have won three or four world titles by now but it’s all in the past now and you have to move on. 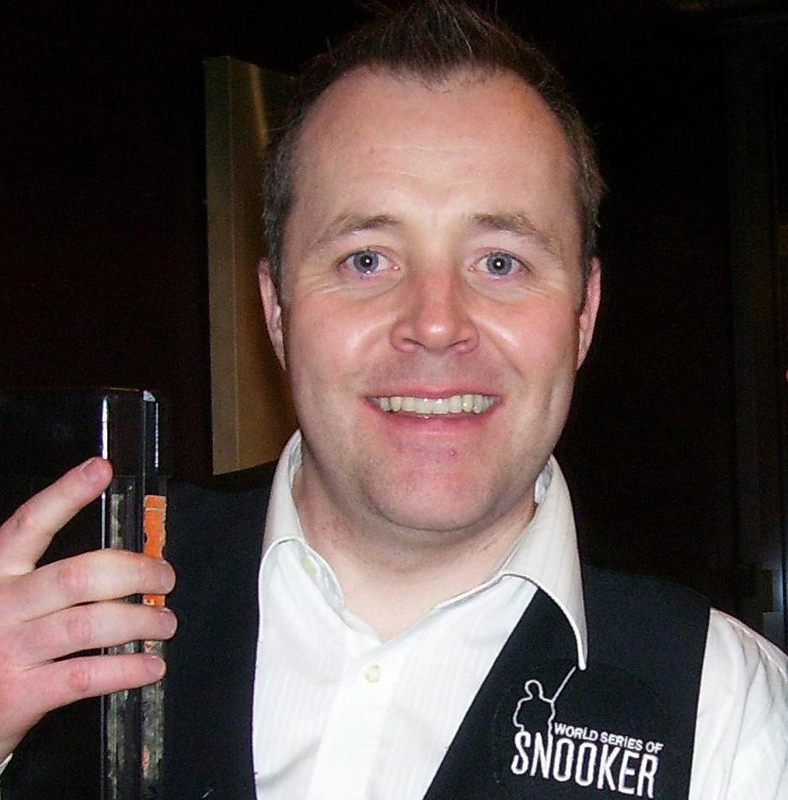 Moving on to 1999/2000, although Higgins enjoyed another successful season, he failed to match the performances of Mark Williams who not only beat him in the semi-finals of the World Championship for a second consecutive year, but went on to win the title and a year later, move ahead of John in the rankings. 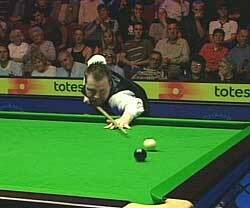 This was despite Higgins reaching his second world final in 2001 where he was to lose 18-14 to Ronnie O’Sullivan. He responded to this setback in the best possible way in 2001/2 however by becoming the first man to win the opening three major tournaments in a season. Despite this, following the birth of his first son Pierce, Higgins appeared to take his foot off the gas for a long period. In fact it was to be another three years before he was to win another ranking event title, the 2004 British Open against countryman Stephen Maguire. It was to be the 2005/6 season where Higgins would really show his undoubted class again though, firstly winning the Grand Prix with a stunning display against Ronnie O’Sullivan in the final. He set a then record of 494 unanswered points as he racked up four consecutive centuries as against an opponent who on the day simply had no answer. He followed this up by beating O’Sullivan again in the final of the Wembley Masters, highlighted by one of the all-time great match-winning clearances of 64 in the deciding frame . As a result of this form he entered the 2006 World Championship as the favourite to win the event for the second time, only to fall victim to a shock 10-4 defeat to Leicester’s Mark Selby in the first round. Nevertheless this was still his best season for many years and he was back among the top four of the rankings. Having expressed his desire to win a second world title shortly before the start of the tournament, he was not to be denied any longer. A year later in his third final he once again faced Selby and this time prevailed in what was the latest finish to a World final ever seen. He not only took the trophy but he made the 1,000th century break to be made at the Crucible theatre during his semi-final match and regained the number one position in the world rankings for the first time in seven years. Having achieved this, the 2007/8 one was a disappointing one for Higgins who failed to reach a ranking semi-final during the entire season. His world title defence came to an end in the second round against Welshman Ryan Day despite an impressive demolition of the dangerous Matthew Stevens in his opening match. John started the 2008/9 season with a run to the semi-finals of the opening ranking event of the season in Shanghai before going on to win the Grand Prix for the fourth time with a 9-7 victory against Ryan Day in the final. His 19th ranking event title, he for many reaffirmed his status as the best player in the game at that time. He continued to perform well for the rest of the season, consistently winning his opening round matches and reaching the final of the China Open before heading to the Crucible in pursuit of what would be his third world title. At 12-10 and 12-11 down against Jamie Cope and Mark Selby respectively in the early rounds it looked like he might have to wait another year but he showed all of his class in both matches to hit back and once in the semi-finals, he never really looked back. Having resisted a storming comeback from young Mark Allen to move into his fourth world final, John then produced his best snooker of the week (and arguably his best for a couple of seasons), to defeat 2005 champion Shaun Murphy 18-9 and clinch a memorable triumph. Up alongside Ronnie O’Sullivan and John Spencer as three time winners of snooker’s greatest prize, John also gave himself a realistic opportunity to reclaim the world number one spot for what would be a fourth season. 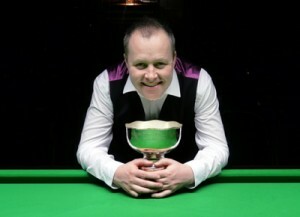 The first half of the 2009/10 campaign saw John maintain his incredible level of consistency by reaching the semi-final stage or better in each of the three ranking events staged. The first saw him suffer a heavy defeat at the hands of rival Ronnie O’Sullivan during the Shanghai Masters, but having gained his revenge early in the Grand Prix it was Neil Robertson who was to deny him in what was an epic best of 11 clash. At the UK Championship he managed to go one further, resisting a spirited fight-back from O’Sullivan to go through to the final with a 9-8 victory having at one stage led 8-2. Unfortunately for him however he was visibly drained against Ding Junhui in the final and ultimately succumbed to a 10-8 defeat. Despite an uncharacteristically error-strewn display against Mark Allen at the Masters, John continued him form into 2010 as he captured his first ranking event tournament of the season, the Welsh Open, with a brilliant 9-4 victory against reigning champion Ali Carter in Newport. Defeat was to follow early in the subsequent China Open but thanks to his performances up until that point and Ronnie O’Sullivan’s early exit at the hands of Tian Pengfei in Beijing, John was already guaranteed to start the 2010/11 season as world number one regardless of his result in Sheffield. As it transpired it proved to be just as well as what followed was what must have been one of the worst periods of John’s life to date. 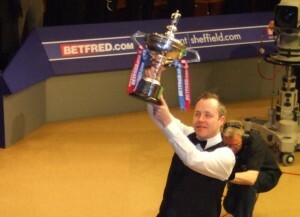 Not only did he see his title defence end early on against Steve Davis at the Crucible but he was also the centre of an allegation by the News of the World which was to eventually result in his suspension from the game for a period of six months having been found guilty of the charge of bringing the game into disrepute by not reporting the illegal approach made to him to discuss the throwing of frames. John was however cleared of agreeing or offering to accept bribes and agreeing to engage in corrupt or fraudulent conduct. John was suspended for the first twelve tournaments as the new season and saw his position at the top of the rankings taken by Australia’s Neil Robertson following the World Open as a result. When John did return at the EPTC5 event in Hamm however, he did so in style as not only did he defeat the likes of Dave Harold and Martin Gould to make it to the final day, but he then went on to see off Graeme Dott and Shaun Murphy to take the title on his comeback, an astonishing result given the circumstances. Somewhat incredibly this was to prove the first of six titles for John during an incredible second part of the season. The second was to come in dramatic fashion at the UK Championship in Telford when he came back from 9-5 down to stun old rival Mark Williams 10-9 despite having needed a snooker at 9-7. He followed this up with the successful defence of his Welsh Open title in Newport before adding the invitational Hainan Classic tournament and native Scottish Professional Championship titles to his name heading to the Crucible Theatre in Sheffield at the close of the season. Drawn against Stephen Lee in the first round, John’s draw at the 2011 World Championship was a tough one from the start but after a patchy first session he was able to improve on his way to a 10-5 victory. His second round opponent Rory McLeod was to provide a stern test of his temperament but after a protracted match, John eventually emerged as a 13-7 winner to book a mouthwatering quarter-final with Ronnie O’Sullivan who was emerging from the shadows of a poor season. Early on it looked as though John would open up an advantage before a miss in the balls at 4-2 proved to be a turning point as O’Sullivan won six of the next seven frames to lead five as Higgins looked very much of sorts. Importantly for the Scot however he was to demonstrate that he is never to be written off and took the last three of the session to come out 8-8 and from there would eventually run out a 13-10 victor. Impressively with the scoreline at 14-13, John after a short pause continued his break and eventually cleared the table with a steely century break to lead 15-13. In the final John would come up against the star of the tournament, Bristol youngster Judd Trump who had made it to the final with a swagger and flair that had many believing that he could go all the way. One of those believers himself, Judd opened up a 10-7 lead after the first day as John laboured to a high break of just 64 and looked like he might well do the unthinkable and become the third qualifier to win the world title. It was not to be however as a crucial missed blue from the youngster at 12-9 proved to be the catalyst for a Higgins revival and having doubled a terrific pink he added the black to seal an 18-15 victory and win his fourth World Championship and third in the last five years. 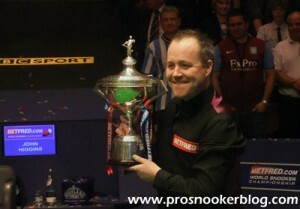 Following his incredible run of success during the first half of 2011, it was perhaps inevitable that he would suffer something of a lull in 2011/12 and this is what happened as he lost at the last 32 stage of the Australian Goldfields Open to Matt Selt, as well as at the last 16 of the UK Championship to fellow Scot Stephen Maguire. Despite those defeats, by the climax of the season’s regular PTC events, the reigning world champion had made it to the final of PTC5, as well notching up another semi-final and two further quarter-finals. The second half of his season however was to prove disappointing as he openly admitted to having not put in the work required on the practice table, something that was reflected in his results. John’s best run was to come at the Haikou World Open as he defeated Marco Fu and Jamie Cope, before losing a high-quality match with Robert Milkins at the quarter-final stage. His season, and world title defence, was to come to an end at the last 16 stage of the World Championship, with a 13-4 defeat at the hands of old rival Stephen Hendry. 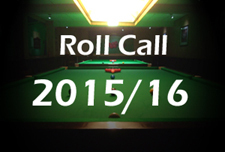 Following his difficult campaign prior, John elected to skip the first two full-ranking events of the 2012/13 season, while also taking the decision to change his cue and have a new practice table installed at his house in a bid to improve his fortunes. Those choices were soon to pay dividends as the Scot came back from 7-2 down in the final of the Shanghai Masters against Judd Trump, to win 10-9 and secure the 25th ranking event title of his career. Making the sixth maximum break of his career along the way, John demonstrated that he was back to somewhere near his best form and that he would remain a contender for the rest of the season. Another title was soon to follow, coming at the UKPTC4 tournament in Gloucester where again he edged out Trump to secure the £10,000 top prize and a place in the 2012 PTC Grand Finals. Judd was however to have his revenge just a few days later, defeating Higgins 4-0 to win the ET4 tournament in Sofia. Following this success, many were tipping Higgins to go far at the year-ending UK Championship, however despite making another 147 break against Mark Davis in their last 16 match, he was not able to complete a comeback, eventually losing 6-5. A semi-final run at the 2013 Haikou World Open apart, the second half of the season was to prove a disappointment for John, as he failed to progress beyond the last 32 stage of any further ranking tournaments, culminating in a last 32 defeat to Mark Davis at the World Championship. John was to make a strong start to the 2013/14 season, defeating Neil Robertson to capture the first event of the European Tour in Sofia, before making it to the final of the Wuxi Classic a couple of weeks later before losing 10-7 to the same opponent. Following those runs however, John was to struggle during the remaining months of 2013, failing to reach another quarter-final, leading him to wryly describe himself as a ‘last 16 machine’ following defeat to countryman Stephen Maguire at that stage of the UK Championship. There were though signs of improvement during the second half of the season, three consecutive quarter-finals at the Welsh Open. Haikou World Open and Players Championship Grand Finals ensuring that he would remain seeded for the World Championship. 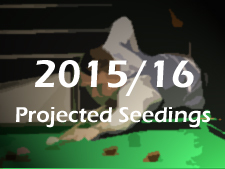 while he lost at the last 16 stage of the China Open to eventual champion Ding Junhui. 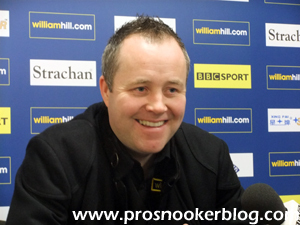 Though his season was to end with a disappointing 10-7 defeat to Alan McManus at the Crucible, his second successive opening round defeat at the World Championship, John was noticeably upbeat during his post-match press conference and optimistic of a turnaround in fortunes during the following season. John would return to winning ways in 2015 by claiming his fourth Welsh Open title at the Motorpoint Arena in Cardiff. Having shown signs of emerging from his slump at the UK Championship and Masters events, the Scot defeated Michael Leslie, Alex Borg, Liang Wenbo Michael Georgiou, Stephen Maguire, Luca Brecel and first-time finalist Ben Woollaston 9-3 to win his 26th full-ranking event title. Though he would not be able to take more silverware during the remainder of the season, a quarter-final run would follow at the China Open, before he won his first match at the Crucible since 2012 against Robert Milkins, losing 13-9 in the next round to China’s Ding Junhui.